Bay window? Check. Enthusiasm for figuring how much track, drapery hardware and curtains you need to dress it? Not so much. Don’t worry, we can help. First, the track: the 6100 Flexible Curtain Track is a great choice for Bay windows. This track can be bent by hand, which allows you to fit the track to the corners, and keep a single, uninterrupted track all the way around the window. Given that the brackets (installed every 10 inches) do not interfere with the movement of the curtain panels, this means the curtains can be moved smoothly from one side to the other with no impediments. To get started, decide on your endpoints: the place on the wall where you want each end of the track to be. Mark each spot. Use a flexible measuring tape to measure each section of the window from mark to mark. Add up these three measurements and there is the length of track you will need to order. For placement, if mounting on the ceiling, you must decide how far out from the wall you want your track to be. Measure at multiple points around the perimeter of the window and mark the ceiling as needed. If mounting on the wall you must decide how far above the window frame you want the track. Measure the distance between the ceiling and the top of the window frame, decide on your distance from the ceiling, measure and mark it in multiple places along the window. 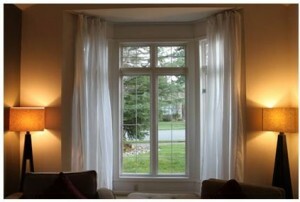 If you want your curtains to have standard fullness, (i.e. the typical amount of ripples), multiply the length of the track by 0.6 and add this to the original track length. This is your curtain width. 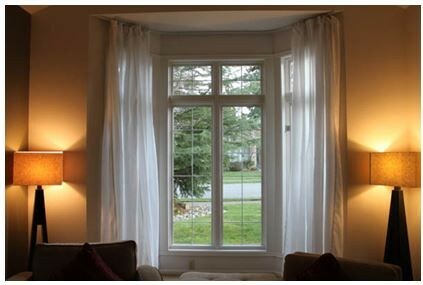 If you want extra fullness in your curtains, double the length of the track for your curtain width. Next, measure from the track to where you want the curtain to fall (just under the bottom frame, all the way to the floor, or somewhere in between.) This is your curtain length. It's a good idea to draw a diagram of the window and mark the measurements on it. You can even email such a drawing to us at info@curtain-tracks.com, and we can help you figure out how much track and curtain you need.